You don’t need much of a recipe for this, either, but I always like to pickle a jar or two of mildly spicy peppers to enjoy in the fall. This a a quick refrigerator pickle, which takes little time beyond slicing the peppers and simmering a simple brine for five minutes. The investment will pay off many times over, since it only takes a few of these pickled pepper rings to spice up any meal. Spicy Pickled Peppers: Wear food-safe gloves or a plastic bag to protect your hands as you slice up two cups of mildly spicy pepper rings. Pack them into a pint jar. Sprinkle 1/2 tsp. dried dill over the peppers and wedge a halved garlic clove down into the jar. In a small nonreactive pan, combine 3/4 c. water, 3/4 c. white vinegar, 1 Tbsp. salt, 1 Tbsp. sugar, and 1/4 tsp. peppercorns. Bring to a boil, then reduce heat and simmer 5 minutes. 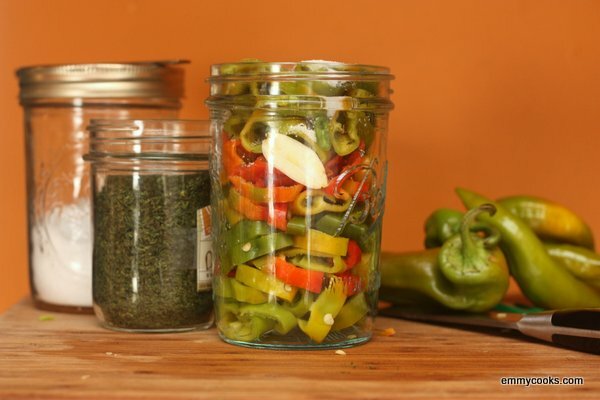 Pour brine over peppers to cover, then cap the jar with a clean lid and transfer to the refrigerator. Allow the peppers at least a few days to pickle before starting to eat them. This entry was posted in DIY, Food, Preserving, Recipes, Snacks and Apps, Vegan or Would-Be-Just-As-Good-Vegan, Vegetables By Themselves and tagged DIY, peppers, pickled peppers, pickling, preserving, summer CSA recipes, summer recipes on September 14, 2012 by emmycooks. I usually freeze my peppers as well. I think I try to pickle a jar as I can use the liquid in cooking as well as the peppers. Canning remains beyond me – but this I can do! Looks great and we need to do something with the peppers…thanks! Where was this idea a few weeks ago when I had too many spicy CSA peppers?! I’m saving this one for next year (or even sooner… for my next farmer’s market visit)! Such a good idea. They’re beautiful! Love the terrific, simpleness of it!